Port Authority recently completed raising of Bayonne Bridge to allow the arrival of larger ships. Bayonne Bridge's navigational clearance of 151 feet was raised to a clearance of 215 feet. The 151-foot clearance limited the size of the vessels under the Bayonne Bridge to 9,000 TEU. The 10,000-TEU ZIM ANTWERP docked at Maher Terminals in the Port of New York and New Jersey yesterday, marking the first neopanamax vessel at the facility to sail under the new Bayonne Bridge. 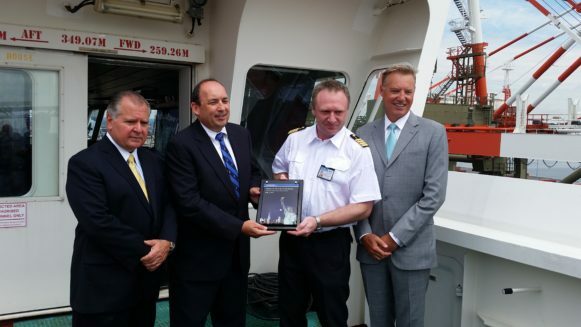 Today, the ship’s captain Piotr Paniec hosted reporters and officials of ZIM, Maher Terminals, and the Port Authority of New York and New Jersey, and received plaques commemorating the event. The Port Authority recently completed the raising of the historic Bayonne Bridge to allow the arrival of larger ships following the expansion of the Panama Canal. The old bridge’s navigational clearance of 151 feet was raised to a clearance of 215 feet—the same as the Verrazano-Narrows Bridge—allowing ships with up to 18,000 TEUs to pass below to access terminals located in New Jersey and Staten Island. The 151-foot clearance limited the size of the vessels that could travel under the Bayonne Bridge to around 9,000 TEUs. ZIM ANTWERP arrived in New York after calling ports in China and South Korea, crossing the new Panama Canal, and calling at Kingston, Jamaica, and the US ports of Savannah, Charleston and Norfolk. The vessel was fully loaded arriving at Kingston, Paniec noted, and arrived in New York with around 4,200 TEU. The captain expected around 2,400 container moves to be accomplished during the ANTWERP’ s 24-hour stay in the port. Following its visit to Maher Terminals, the ZIM ANTWERP will proceed to Halifax and from there will sail to Kingston, traverse the Panama Canal, and head to Slavyanka, near Vladivostok, Russia. The vessel is one of 15 in the Zim Container Service Pacific (ZCP).